In Arizona, personal injury cases occur every year and they involve a situation where someone is injured because of another’s negligence. These types of accidents often occur on the roadways. One driver may be speeding, texting while driving or driving drunk and cause an accident. If you have been injured in this type of accident, then you may have a personal injury claim. Personal injury cases also occur in the workplace. You might be run down by a careless forklift driver and receive lacerations and broken bones. You might be exposed to toxic substances that cause a severe illness. Electrocutions are another common workplace accident. Personal injuries can also happen at home and often the victims are under the age of five years old. A toy is defective or malfunctions causing a child to choke on a small part or otherwise be injured by it. Personal injury claims can arise out of an animal attack, a recalled vehicle, a defective medical device or a drug recall. Just about any type of accident you can think of where someone is injured because another person, company or entity was somehow negligent can result in a personal injury claim. Accidents like this are unexpected and they leave families with high medical bills to pay and weeks of recovery where the victim may not be able to work. In some cases, there are property damages to consider or ongoing medical needs. A family can quickly be overwhelmed by all these problems. But by filing a personal injury lawsuit, they at least have the opportunity to recover their expenses and financial losses. Often, an insurance company will take advantage of a family’s shock and urge you to settle your case for a much lower amount. If you do sign away your legal rights, then you cannot change your mind later and file a suit. That’s why most attorneys advise victims to have a lawyer present at all negotiations. Generally speaking, those who have legal representation will walk away with a larger settlement. In Arizona, there’s a statute of limitations on most types of personal injury claims. This means you have a set time limit where you can file. Once the time has expired, you will not be able to file a claim. Often, those who file a claim right away fare better in the legal system than those who wait for months before filing. 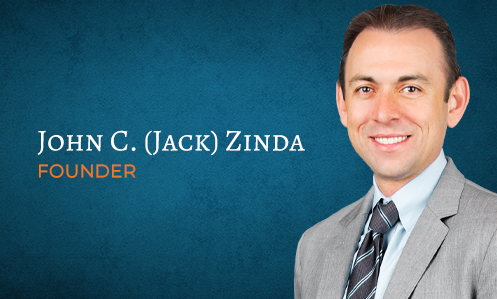 At Zinda Law Group PLLC, we encourage victims to reach out for professional help from an experienced Yuma lawyer. Our firm gives you the benefit of years of experience and our staff and lawyers are caring and compassionate individuals who understand what you are going through. Regardless of how your accident occurred or what happened, we invite you to contact us if you believe someone else was responsible for your injuries. Our lawyers offer free case evaluations so that you can sit down with a Yuma personal injury lawyer and discuss your case. If we believe that you have a valid claim, we will work with you to get the highest possible settlement. We speak to witnesses, gather evidence and prepare to win in court, but we do try to settle outside court because this if usually faster and less expensive for you. We will inform you of your rights and help you get the compensation you deserve for things like pain & suffering, lost wages, ongoing medical treatments, and medical bills. We handle all types of animal attack claims in Yuma and surrounding areas and we understand the trauma associated with this type of injury. You may have serious physical and emotional injuries to deal with. You could be facing multiple surgeries. Some drivers just don’t pay attention to bicycles on the road. Careless drivers should be held responsible. It sends a message to others that this behavior won’t be tolerated. Birth injuries can be heart breaking, especially when caused by a negligent doctor or nurse. This is the worst type of medical malpractice and it can leave your family with a lifetime of pain and sorrow. A fun day of boating on the lake can turn deadly when people have too much to drink or get too busy to safely operate the boat. A boat owner and/or driver may be found liable. Severe burns can cause much pain and permanent disfigurement. Recovery may take years, so be sure to get the level of compensation you need for ongoing medical treatments. Construction work is dangerous and workers get injured every day in America. Whether you have fallen off rickety scaffolding or been exposed to toxic chemicals, get help today from Zinda Law Group PLLC of Yuma, AZ. Today’s highways are congested and many drivers are not paying attention. A severe auto accident can cause you to lose time from work. We handle all types of auto accidents including distracted drivers, drunk drivers, unlicensed or inexperienced drivers and many others. We’ll help you get compensated for damages and expenses. Catastrophic injuries usually leave the victim with life-altering consequences. These types of injuries often require ongoing medical needs. These could be physical or emotional trauma and injuries like brain trauma, spinal cord injury, amputation, severe burns and others. Child abuse is a terrible thing and it should be handled with compassion, but finding the personal responsible needs to be a priority. Abused children may need years of therapy and medical help to get well. Our Yuma law firm handles cases involving molestation or physical abuse from coaches, teachers, daycare workers, clergy, and others. Businesses that serve alcohol have a responsibility to notice when a patron is visibly intoxicated. They are required by law not to serve these individuals or minors. This is known as dram shop liability and business owners who violate this law can be held responsible. Drowning accidents are devastating for any family. A fun, leisurely day can suddenly turn into a nightmare. The investigation may show that someone was negligent regarding safety, and that person can be held responsible for serious injury or death. Gas explosions can occur for many reasons. A faulty gas line inside or outside the house can lead to a leak and then a serious explosion. Gas explosions can be caused by construction workers who are careless when digging. Violent explosions like these may result in death or serious burn injuries. Gender discrimination does still exist in the workplace regardless of the laws against it. Men and women should receive the same pay for doing equal work. Big insurance companies have the best lawyers on their staff and most people are no match for their skills. That’s why it’s always best to have your own team of legal professionals at the negotiating table. When a medical professional behaves in a careless, reckless or negligent manner and it results in injury to a patient, medical malpractice occurs. If you or a loved one have been injured by medical malpractice, you may be able to obtain compensation for your pain and suffering. Those who work around asbestos may get mesothelioma and exposure may have occurred 5, 10, 20 or 30 years ago or even longer. Asbestos can still be found in products today and in spite of current federal safety regulations, victims still suffer with this debilitating illness. Motorcycles may be fun to drive, but when other vehicles on the road get careless, the driver can be seriously injured. Even when you wear a helmet, major injuries may occur like brain trauma, spinal cord trauma, broken bones or lost limbs. One in three nursing homes has been shown to provide substandard care for their elderly patients. This is a crime that must be dealt with and you can do so using the law to bring the guilty to justice. Pedestrians are very vulnerable while out walking, especially at night. Those who aren’t watching can strike and kill or seriously injure a pedestrian. If you’ve been a victim of this type of accident, you may be able to recover compensation. Premises liability is all about holding the property owner responsible when someone is injured on their property. You might slip and fall in a restaurant or store. The property might have dangerous items lying around or an unexpected hole in the floor or ground. Zinda Law Group PLLC handles all types of product liability claims including the DePuy hip implant, transvaginal mesh, Accutane, and many others. School bus accidents are scary and often there are multiple injured on the bus. It’s important to find out the true cause of the accident and our Yuma law firm can help. We’ll do a thorough investigation to find out who was to blame for the accident. Spinal cord injuries may change the very course of the victim’s life. Trauma to the spinal cord can cause temporary or permanent paralysis and your quality of life will be greatly diminished. This requires years of ongoing medical treatments. Let us help you get the money you need for these expenses. A devastating brain injury requires specialized medical care. It may take many years to recover. Our qualified personal injury lawyers will help you get the financial compensation required for these and other expenses. Truck drivers have a special duty to be alert and skilled when behind the wheel of an 18-wheeler. Big trucks weigh thousands of pounds and they can cause severe accidents with catastrophic injuries. An investigation may show that the driver was sleepy, on drugs or texting when the accident occurred. Negligent truck drivers and trucking companies should be held accountable for your accident. OSHA safety regulations should protect workers, but people do receive job-related injuries. Our firm helps those injured on the job to get compensation for things like toxic exposure, chemical burns, electrocution, falling, industrial accidents and others. Our Arizona injury law firm works with victims everyday who have been injured in some type of accident where another person, company or entity was responsible. We never charge a thing until we win your case. You won’t have to worry about court costs and legal fees unless we win your case. Speak to one of our Yuma personal injury lawyers today to schedule your free appointment.